Infographic Shows It’s Time to Switch to Reusable Grocery Bags! Disposable plastic bags may seem like an unremarkable item, but they wreak havoc on our environment. They are a convenient way to carry things home from the store and many people do not give them much thought. However, the impact single-use plastic bags can have is staggering and it is time to make the switch to reusable grocery bags. 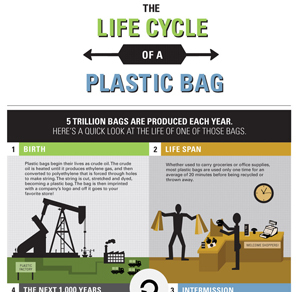 If you haven’t checked it out already take a minute to go over this infographic that explains the life cycle of a plastic bag. The thin film plastic of single use disposable bags is made from oil and natural gas. These materials are nonrenewable resources which means they are in limited supply. Now it is likely there are enough of these resources to last for many years to come, but responsible management of these materials now means we will have them for other, more important uses for even longer. It is a shame to see these nonrenewable materials used for disposable items that are just not essential. Once the bags are manufactured and customized with a store’s branding they are shipped to various retail establishments where they are used to package a customer’s purchase for easy carrying. Many people believe these disposable plastic bags are simply given out for free, but that is not the case. The retail establishments purchase the bags and factor this expense into their prices, so while plastic bags do not appear as an item on the receipt customers are in fact covering this cost. Once you make the switch to reusable grocery bags, you can actually receive a discount at some retail outlets. On average, single-use plastic bags are used for 20 minutes. In fact, if you look into the trash can outside of your local drugstore, you will even see the disposable plastic bags inside showing that many times, single use plastic bags are actually used for minutes. When you look at all of the resources and time spent manufacturing these bags it is very lopsided how little time they are actually useful. Once shoppers get the bags home they unpack their goods and either ball the bags up and keep them to use for another purpose, or they dispose of them. Many people dispose of single-use plastic bags by tossing them in the trash once they get home. Plastic does not break down the way paper and other biodegradable materials do, so once the plastic ends up in a landfill it is there forever. Many people re-purpose disposable plastic bags to line trash cans or clean up after pets, but ultimately these bags still end up in a landfill where they will just sit and possibly leach their chemicals into our water supply and food chain, harming wildlife. Hey Wait, Aren’t Plastic Single Use Bags Recyclable? Plastic bags are in fact recyclable, but many curbside recycling programs do not accept them. A lot of plastic ends up as litter. It is likely some of this is the result from careless people, and due to the lightweight construction bags will oftentimes be lifted from open trash cans or even landfills and be carried off. Regardless of how plastic litter comes, to be the bottom line is that it is a major environmental problem that reusable grocery bags and your company can help solve. Plastic bags pose risks to animals who can easily mistake the bags as food or become tangled in them, and the problem just spirals out of control from there as consumed plastic is passed through the food chain. This infographic is full of great info about the full life cycle of plastic bags and it really illustrates the impacts of these disposable nuisances. Check it out and share it on social media but if you are ready for your company to be a part of the solution, fill out a product quote request located on every page of our site and get started creating your reusable grocery bag for marketing or retail use. Next Next post: Are Certified Reusable Bags Better for the Environment Than Plastic Bags? We Want to Know…What’s In YOUR Reusable Bag?